Isaac Newton’s third law of motion states that “For every action, there is an equal and opposite reaction”. This law is not only valid in motion, but is also valid in life and in business. In business, every high quality goods or services rendered to a client deserves a commensurate reward in monetary terms. However, In Nigeria today, several goods and services rendered do not receive a proportionate inflow of benefit from the client to the seller. Perhaps because such products are not well appreciated. When a high quality product is not well appreciated by a client, ridiculous prices will be offered for such products; hence, the amount clients pay for a product is dependent on how well they value and appreciate it. Irrespective of the quality of a product, it remains valueless unless it is placed in an environment where the value is appreciated; it is in such environment that each unit of such product will be adequately paid for. A foremost example of products not well valued is high quality graphic designs; till today, only a few people appreciate creative graphics, hence the need to create a conducive atmosphere for the sales of high quality graphics. The saying that “necessity is the mother of invention” is so true; it was this great necessity which soon became a need that birthed an extremely innovative platform named Afridext.com. Afridext.com is an e-commerce platform where high quality graphics are crowd – sourced for a well deserved price while ensuring that every client gets the very best designs available; this inventive idea is efficacious because hundreds of designers compete to give the best design to the client; hence, having received the best, the client and the winning designer goes home happy. Afridext.com comprises skilled, capable, vast and dexterous designers who have the ability to create mind-blowing and inspiring graphics while documenting the exact imagined desire of the client in form of an alluring graphic art. I am Olayanju Oladipo, I hail from Ilero, Kajola Local Government Area of Oyo State. I studied Veterinary Medicine at the prestigious University of Ibadan where I also obtained a Master’s degree in Information Science. My upbringing modelled me to juggle many things together hence my ‘diversion’ into the field of Information. What inspired the creation of the platform Afridext.com? My first internet business was set up in 2008. Then the internet had a lot of solutions but there was the constraint of online payments while using some services. I remember paying exorbitantly to use the “pay for me” services of some merchants online in order to buy goods and services. I have outsourced services and jobs on top freelancing platforms in the world and to my surprise Africans have massive population on these platforms. 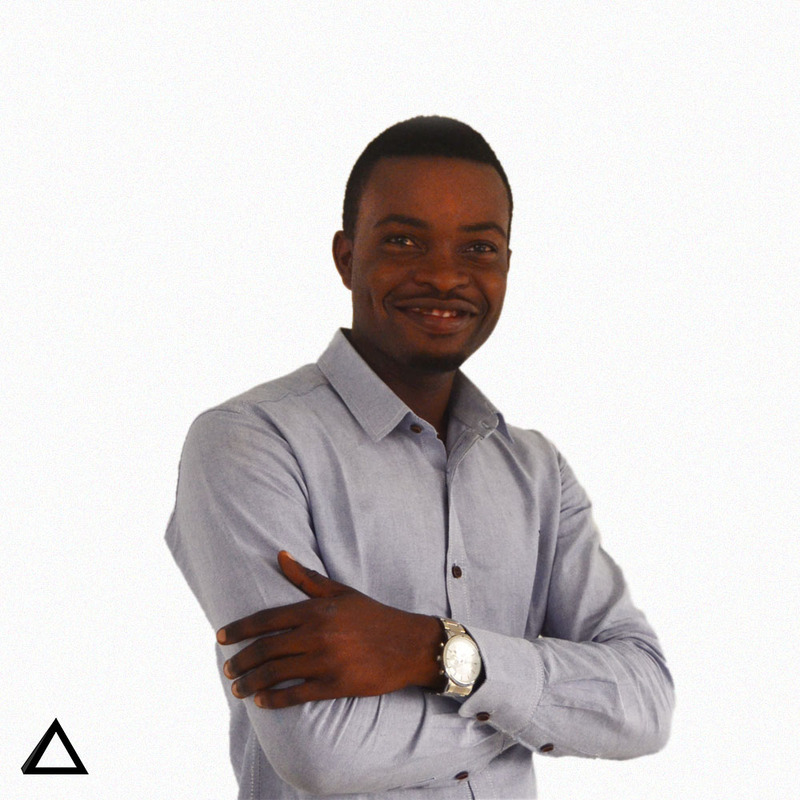 Therefore, I decided to create Afridext which is a platform set to showcase the dexterity of African graphic designers while at the same time providing individuals, corporate bodies, NGOs, etc. with an efficient platform to have their graphics needs met without the barrier of international payment and other forms of bureaucracy. Afridext also allows African designers to provide high quality designs relevant to the African market. We have a multi-systemic graphic solutions platform developed for graphic designers and graphic designs users. Afridext is home to dexterous graphic designers with awesome portfolios, our platform allows a client with graphic design needs (Logo, Banners, Letterheads, ID cards, Infographics, Brochures, Web design etc) to network with thousands of designers to have their jobs awesomely delivered. An important section of our platform is Graphic design crowd-sourcing in which a client has hundreds of designers competing to give the best to the posted graphic design request. With this, the client has myriads of high-end designs to choose from and award a cash prize to the winning design. For designers, Afridext gives a win-win solution by promoting their portfolio while giving global exposure to prospective local and international clients. We are the first graphic design platform that ensures 24hours local account crediting for jobs completed. Our platform has Africa’s culture at heart hence we have incorporated cheap and efficient solutions to satisfy graphic design needs for other social functions including wedding, political campaigns, burial a.k.a. celebration of life etc. What were the challenges you faced in the process of implementing this brilliant idea? Challenges are the necessary tools for idea refining. A major challenge was how to technologically replicate our idea. As an information scientist, the role of SDLC (System Development Life Cycle) came into play. We researched into the graphic design market with designers and clients in mind. Obviously gathering a success-hungry team is another great hurdle which we were able to cross. How did you source for funds to implement this platform? We have bootstrapped right from the onset to having our MVP. The team has been very supportive and we all believe having a great product that provides great value to our major stakeholder segments i.e. 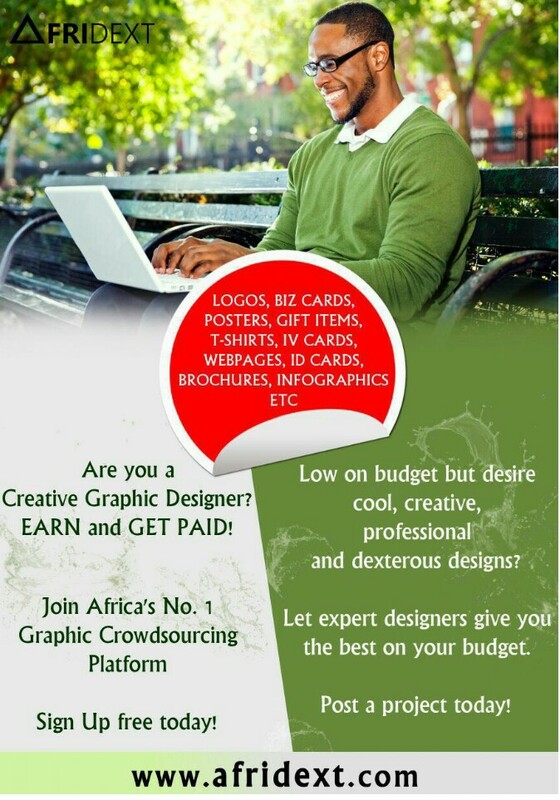 graphic designers and graphic design users, will expose us to reasonable funding soon. I see that your presence on Google search depicts Afridext Integrated Service, so asides graphics designs, what other service is embedded in Afridext Integrated service? Afridext is made up of passion-driven individuals from all walks of life. We have the goal of using technological innovation to solve problems. Plans are in top gear to venture into other sectors of the economy with specific interests in Health, Agro-Allied and Agriculture industries. Can you tell us in precise terms, the branding strategies that have been employed by Afridext Integrated services to attain great growth in such a time? Innovation cuts across every facet of our business, we like to develop and implement the unimaginable as long as it takes us a step closer to our corporate objective, hence, we reflect innovation in the product development, branding and marketing and customer service. Similarly, like I earlier pointed, a great team is all you need. We have experienced brand strategists, digital marketers, competent web developers and seasoned business developer. Everybody understands the vision of the start-up and we have developed short and long term plans to achieve this vision. More so, we all treat Afridext with aesthetics and to all of us, Afridext is our first “Baby”. We are nowhere near where we want to be yet, but we are on our way there. The last Spirit of Nigeria Contest launched by afridext.com is a great initiative which pulled together several brilliant designers and portrayed a blazing nation building theme really capable of inspiring the upcoming generation of leaders; how did you come about this idea? Again, the Spirit of Nigeria contest was inspired by innovative thinking, which has become our culture. We mostly do not scramble to find and adopt unique ideas. We all know the nation has been tagged to be wallowing in doldrums, economic recession, unrest in the North East, unemployment, unpaid salaries in many states! But eventually, the Nigerian spirit always prevails. We are moving forward in spite of these challenges. Hence, as a proud Nigerian business, we felt the need to engage people positively by giving Nigerians reasons to celebrate the 56th anniversary with a little reward for creativity. What other line of business are you currently in? We are also into Corporate branding, Printing services and Events packaging and management. What brought you into entrepreneurship? We all cannot wait for the unavailable jobs! My motivation has always been the need to create value that will enrich human living experience even for the least persons within the society. If Eastman, Carnegie, Jobs, Walt, Gates, Dangotes, Otedola, to mention a few had not taken a step, millions of jobs would not have been created today. Although we understand it is not “easy to do business” in our ecosystem but we must remain dogged to surmount every obstacle and challenge. It takes passion, understanding, efficiency and thinking out of the box. Most importantly being a coach and not a boss! What are the things you think a potential entrepreneur should watch out for in the choice of a life partner? Someone that will understand why you are dreaming and why you want the dream to materialize. What are your final words for aspiring and upcoming entrepreneurs? Never say never! Keep working hard, keep learning and the reward will definitely come if you don’t give up. Quitters never win! Every big company or small start-up that fears taking the bold step of implementing their innovation will soon go into extinction. You can have brilliant ideas, but your ability to get them across successfully is Innovation your ideas won’t get you anywhere if you cant convey it in an innovative way, Steve Jobs of apple said Innovation distinguishes between a leader and a follower. If this week’s report inspired you, let us know. Drop a comment below. Previous Previous post: Donald: how a lawyer turned entertainer rakes in millions! Next Next post: The future of globalization; does Africa stand a chance?